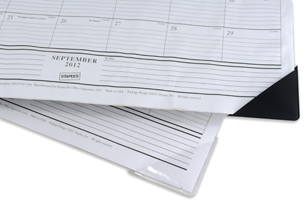 We offer calendar corner protectors in either a black suede or a clear vinyl. 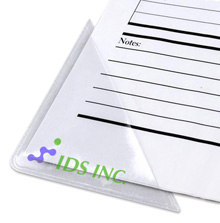 Both the clear and black can be purchased with an adhesive backing, or with a non-adhesive back. Our calendar corner protectors are perfect for any company looking for a more customizable product that can be designed and decorated to suit the application. We offer stock calendar corner protectors to fit nearly every size of desk calendar, all either with or without the peel-and-stick adhesive back. Choose from virtually any solid color or transparent vinyl. Additionally, we will also add your unique company logo.